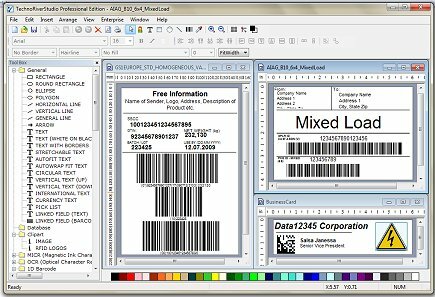 SmartCodeStudio Professional Edition is the industry-leading label design, barcode printing and RFID(Radio Frequency and Identification) software. It offers many powerful features like WYSIWYG label design, image acquisition, image/vector graphics support, Rich Text formatting, advance print options, circular text and flexible barcode settings, database integration, records filtering, print process management, autofit text, international text, mail merging and serialization. The user interface is also highly intuitive and extremly easy to use. It supports all the industry widely used 1D and 2D barcodes : CODE128, CODE39, CODE39 FULL ASCII, CODE93, EAN13, EAN8, I2OF5, ISBN, ISSN, MSI, ,POSTNET, RATIONAL CODABAR, RSS14, RSS14 Limited, RSS14 Stacked, RSS14 Stacked OmniDirectional, RSS14 Truncated, S2OF5, UCCEAN128, UPCA, UPCE, ITF14, UPC Extension 2, UPC Extension 5, PDF417 and Datamatrix. Accuracy and quality are the two key aspects of the barcode engine of SmartCodeStudio that produce the most recognizable barcodes in the industry. To assist in the design of labels, SmartCodeStudio also comes with one of the industry largest and expandable Label Stock Database. The Stock Database stores the dimensions of many different labels. This greatly simplifies the task of label design. Whether you are printing hundreds or thousands of labels per day, or whether you have to print on different printers with different label designs, TechnoRiver`s state-of-the-art SmartCodeStudio is guaranteed and field tested to provide the robustness necessary in meeting all the demands of your business.